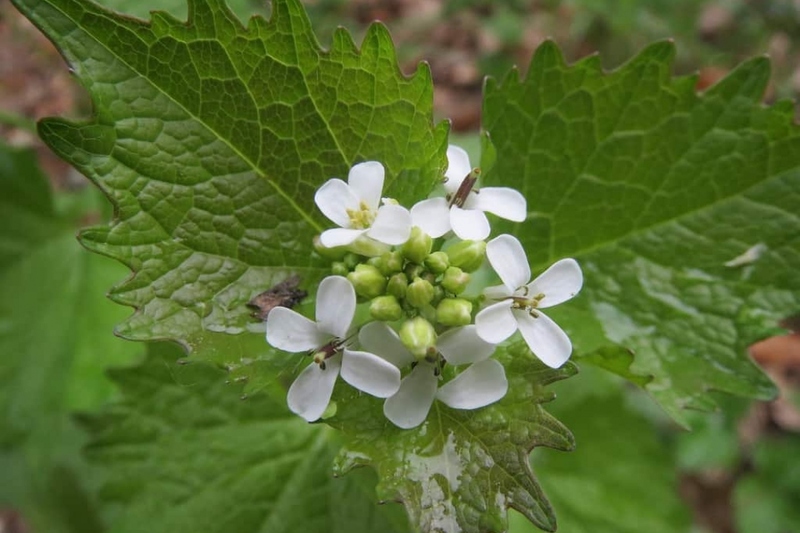 Garlic Mustard (Alliaria petiolata): identify and learn about your plants with Groww. Clumps of round-shaped, slightly wrinkled leaves, that when crushed smell like garlic. Alliaria petiolata is a biennial flowering plant in the mustard family, Brassicaceae, native to Europe, western and central Asia, and often found growing along the margins of hedges, giving rise to the old British folk name of Jack-by-the-hedge. In the first year of growth, it forms clumps of round shaped, slightly wrinkled leaves, that when crushed smell like garlic - the genus name Alliaria, "resembling Allium", refers to the garlic-like odor of the crushed foliage. The second year it will flower in spring, producing cross shaped white flowers in dense clusters, the stems elongating into a spike-like shape later on - then the plant produces upright fruits that release seeds in mid-summer.